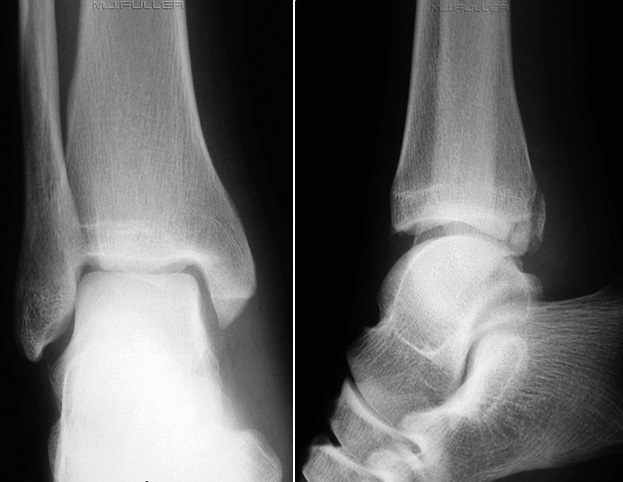 The x-ray above shows what could be interpreted as a relatively innocuous injury – an apparent isolated undisplaced fracture of the posterior malleolus of the ankle. Suitable for conservative management, discharge from ED, and follow-up in fracture clinic? The posterior malleolus is typically fractured by rotational injury an/or axial loading. Posterior malleolar fracture WITHOUT other injuries to the ankle or lower leg is uncommon – only 4% in one case series examining all ankle fractures. More commonly, posterior malleolar fractures occur in combination with proximal fibular fractures (Maison-Neuve), syndesmosis injury, posterior tibiofibular ligament injury, and/or spiral tibial diaphyseal fracture. These injuries commonly require surgical intervention, and the presence of a posterior malleolus fracture with them worsens prognosis. Even if another injury is NOT present with a posterior malleolar fracture, criteria for surgical intervention are complex and highly surgeon-dependent. 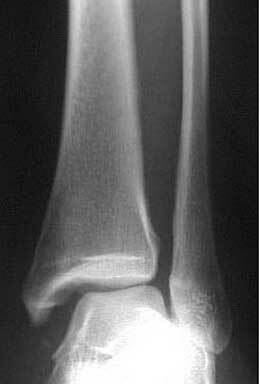 Upon discovery of a posterior malleolar fracture in the ED – maintain a high index of suspicion for associated injuries. There is a high chance that other structures are injured also and that surgical intervention is required for an unstable ankle. Careful clinical examination is required, (including the proximal lower leg), and the threshold for further imaging (especially CT) should be low. In accordance with this, the orthopaedic department at Auckland Hospital have requested that we refer all posterior malleolus fractures to them acutely for review, even if no associated injuries are immediately apparent. This entry was posted in Education and Training, Trauma, Uncategorized and tagged ankle, fracture, pitfalls by Scott Orman. Bookmark the permalink.